The woolly spider monkey, or muriqui, is one of the most endangered primate species in the world today. Because of deforestation pressures in its natural habitat- the Atlantic coastal forests of southeastern Brazil-the muriquis are confined to less than three percent of their original range. There are now only a dozen forest fragments known to support a total muriqui population of about 500 individuals. This book traces the natural history of the muriqui from its scientific discovery in 1806 to its current, highly endangered status. The book provides a case study of this scientifically important primate species by balancing field research and ecological issues. Through Strier's accessible presentation, readers gain a broad understanding of primate behaviour and tropical conservation. The book also gives a practical account of how to set up and pursue an in-depth longitudinal study of an animal population, while describing the excitement of gaining first the muriquis' trust and then insights into their lives. 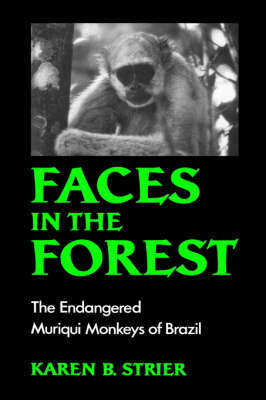 The author offers the unique perspective of a highly committed anthropologist who has devoted years to the observation of this unique species, while working to train students and to protect the muriquis' remaining forest habitats. The book will interest biologists, primatologists, and zoologists, as well as anyone concerned with conservation, ecology, and animal behaviour.